From WordPress 4.0 you’ll be able to select your native language directly from the install screen as shown below. 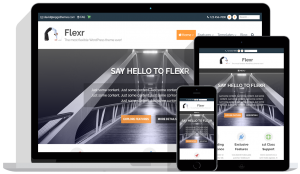 This makes it more important than ever to be able to translate your WordPress theme to match the language used on the rest of your site. This post explains how do to exactly that! Inside the WPGO theme framework all instances of text, and labels, are wrapped inside special functions so they can be translated into any language as necessary. 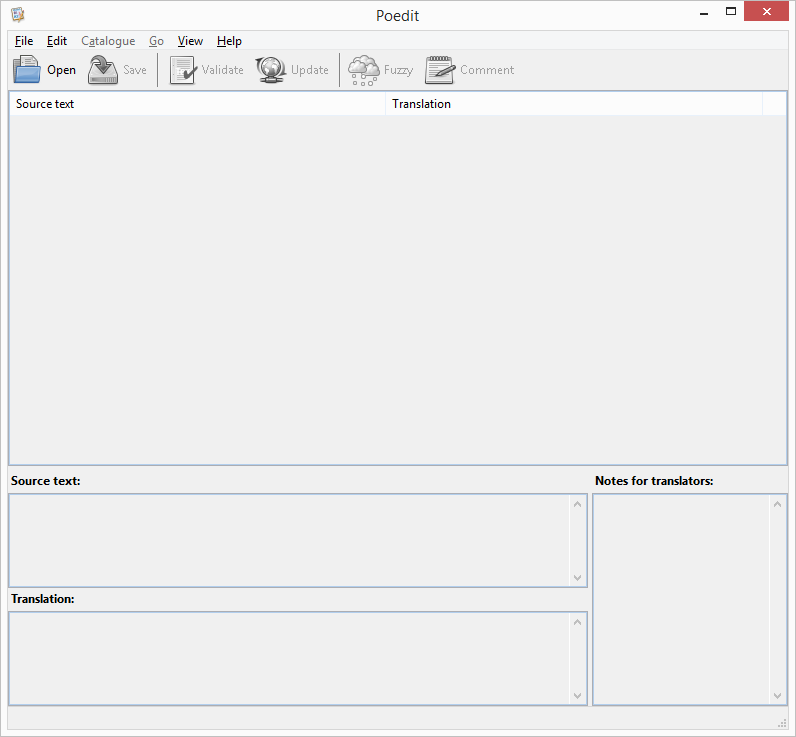 There is also a master translation file (a POT file) which can be found in the theme languages folder. 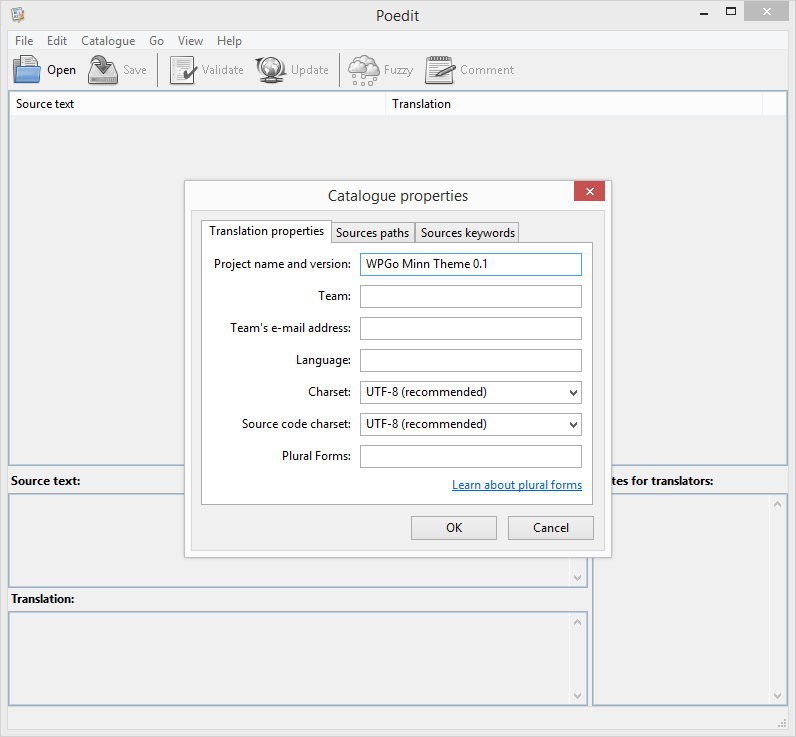 The translation process utilizes the the POT file shipped with the theme to create an output file with extension .po which is used to display translation phrases in your own language. Let’s do this next. 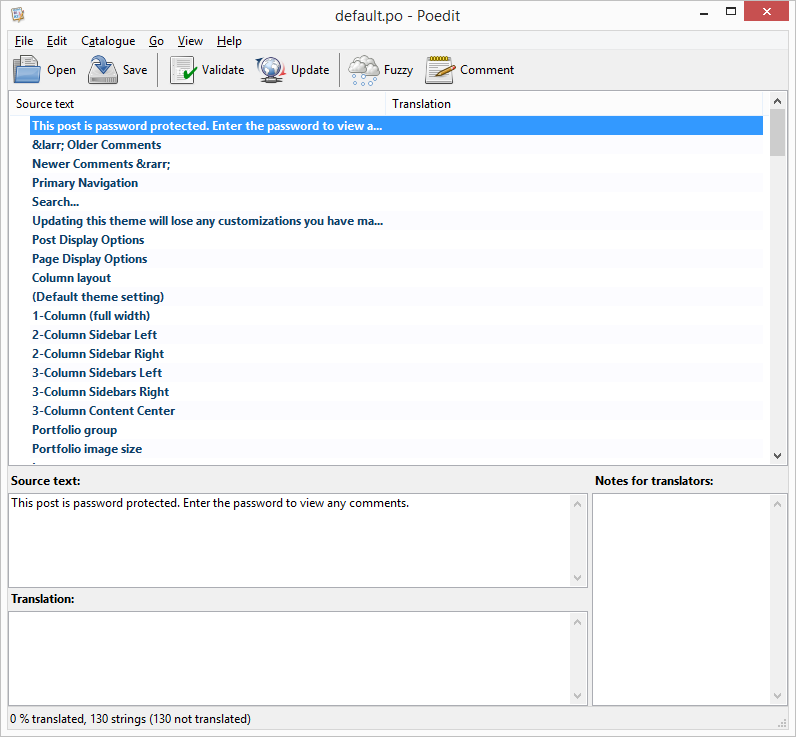 Navigate to the languages folder and open the POT file in Poedit. You’ll see the “Catalog properties” dialog box appear. You don’t need to change any of these settings so just go ahead and click OK to close. The default filename will be something like default.po. This is OK for now but you will need to change this later on to be more specific so WordPress knows which file to use for language translation. For now just go ahead and click Save to close the “Save as…” dialog box. This will create a .po file to your theme languages folder. You may also notice that a .mo file is saved along with the .po file. Make sure that these two files are kept together. If you save your .po file in the parent theme languages folder then that’s fine but you should be aware that it will be overwritten during a theme upgrade. You can prevent this by using a child theme and saving the .po file in the child theme languages folder (create one if the folder doesn’t already exist). 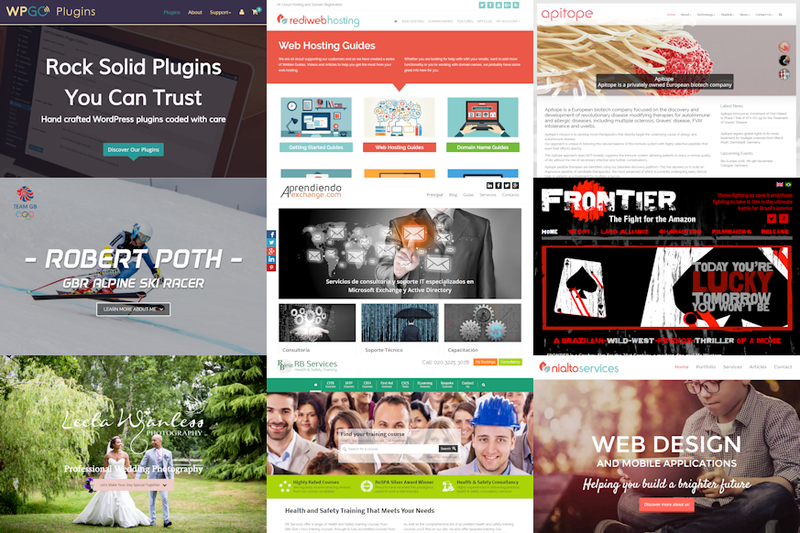 All WPGO themes support the .po file being located in the in the parent them languages folder OR the child theme languages folder. If a child theme is active then the child theme languages folder will be checked FIRST. If no language file (that matches the locale set in WP config) is found then it looks in the parent theme languages folder. This means that you can use a custom translation file in a child theme and it won’t ever be overwritten during theme updates! Now for the fun part! You can start to create theme translations for any phrase used in the theme in your own language! Simply click on a phrase from the list in the main window to get started. Note: If you save your .po file in the parent theme languages folder then that’s fine but you should be aware that it will be overwritten during a theme upgrade. Prevent this by using a child theme and saving the .po file in the child theme languages folder (create one if the folder doesn’t already exist). 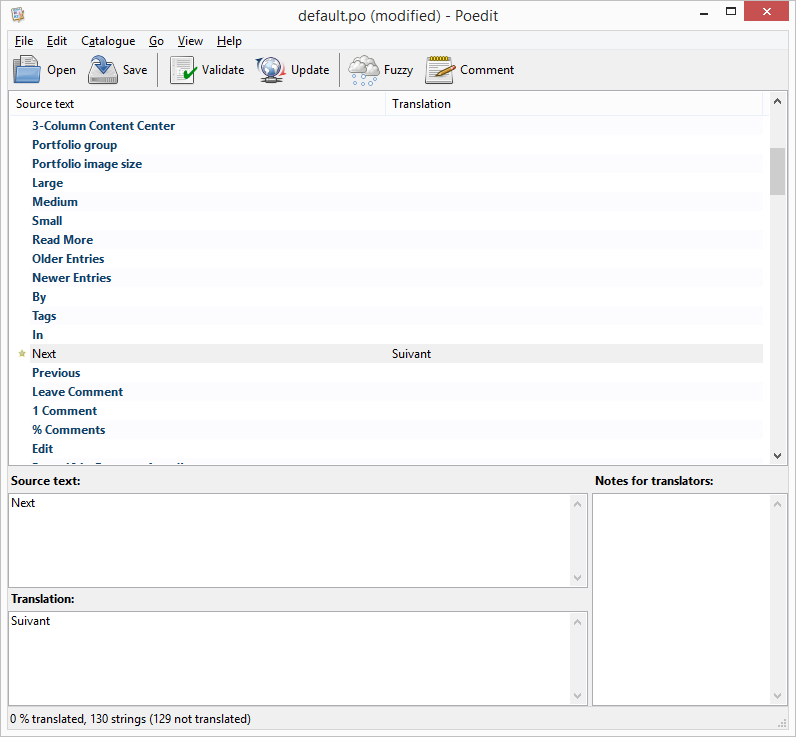 In Poedit hit CTRL+F at any time to do a quick search for the phrase you want to translate. When you have finished editing make sure to save your work by clicking the Save icon. It’s important that .po (and .mo) filenames match the desired locale as specified in wp-config.php (located in your WordPress root directory). The naming convention is language_COUNTRY.po. If you want to learn more about how WordPress handles language translation then click here to find out more. Has this document been useful to you? Please contact us if you think this document could be improved in any way. We are committed to providing the highest level of support!